How safe are our supply chains from terrorist attack? The recent Paris attack reminded the world that terrorism can hit at any time, any place. The response of governments has been to increase security in public spaces – and rightfully so. But what if these same terrorists would attack supply chains instead? Hitting just a few strategic targets in the energy trade, for example, could bring the entire global economy to a halt. To avoid such disaster, companies and governments should be more aware of this perceived “low probability threat”, and develop the tools to protect their economic interests and those of the world. The attacks in Paris, the bombing of a Russian plane in Sharm El Sheikh, and most recently, a disability center in San Bernardino, shook the world. With hundreds of innocent civilians dead, governments all over the world responded by increasing security measures in public spaces. It is a much needed response, as our safety is of utmost importance. But while focusing on public spaces, we should not leave another important flank unprotected: our infrastructure and supply chains. Ports, waterways, roads: they all play a vital role in supplying our needs. When left neglected, the consequences on the economy and our society could be disastrous. Two risks are of particular importance: an overshoot of public safety measures affecting supply chains, and a negligence of securing supply chains, leaving them vulnerable to attack. The first risk is for supply chains of goods to be disrupted because of public safety measures. We have seen this before. “After the September 11, 2001 terrorist attacks, the U.S. government closed the country’s borders and shut down all incoming and outgoing flights. The impact on many supply lines was immediate,” wrote Yossi Sheffi and James B. Rice Jr. in a MIT Sloan article. “Ford Motor Co. had to idle several assembly lines intermittently as trucks loaded with components were delayed coming in from Canada and Mexico. Ford’s fourth-quarter output in 2001 was down 13% compared with its production plan.” Although not directly hit, the disrupted flow of goods caused significant damage to business and delayed supply. But there is a potentially much graver danger from neglecting supply chain safety: terrorist attacks aimed at precisely those lifelines of our economies. For now, such attacks have been limited: according to Daniel Ekwall’s review of the official terrorist statistics from MIPT Terrorism Knowledge Base transport activities represent only 4% of the targets in 2006 and 5% in 2007 – as low a number as one can find. But the number of supply chain related attacks has increased steadily over the past decade, reaching 3299 attacks in 2010, a recent PwC report found. And when terrorists do attack supply chains, the consequences could be disastrous. 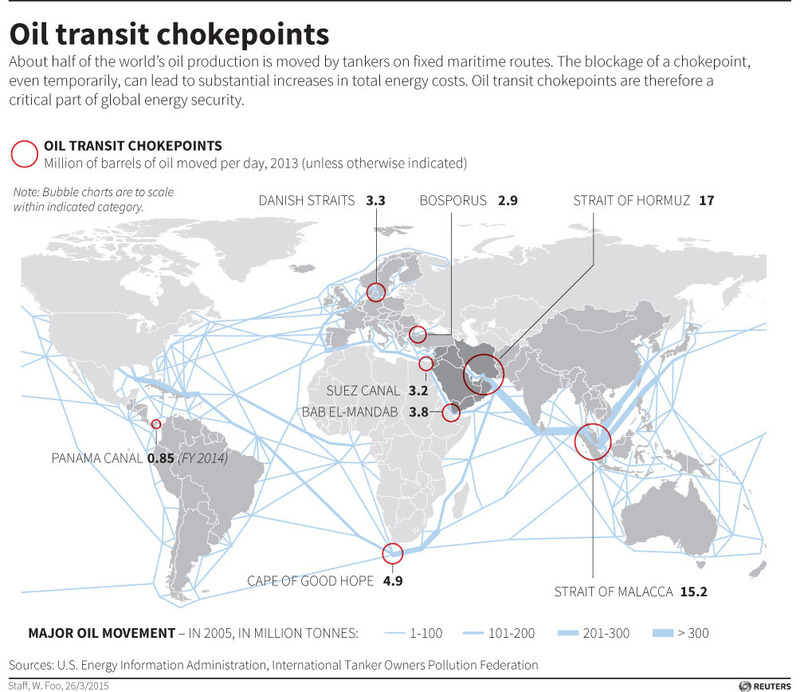 Seventy to 80% of the world’s oil flows through only three major check points: the Suez Canal, the Strait of Hormuz, and the Straits of Malacca (see the chart below). The closing of one or more of these passages would significantly disrupt the global energy supply chain. The Strait of Hormuz is a particular cause for concern: situated between the Arabian Peninsula and Iran, almost 20% of global oil trade passes through there. Major freight hubs might be targets for terrorist attacks, as well. 14.8% of containerised and air freight traffic moves through the Hong Kong – Shenzhen freight cluster. The Port of Shenzhen is one of the most important ports for China’s international trade and therefore key to the supply of many factories and customers in the world. Highway computer networks and traffic management systems are also vulnerable to terrorist attack, and could be hacked and disrupted to create chaos. This could make the transport on national road systems and in cities impossible. Planes could collide. Each time they enter an airport aircrafts are at risk because of the sharing of information across a number of electronic systems. Tracks in rail traffic could also be re-set to cause trains to crash. What matters then, is to recognize supply chains as a target, and take adequate measures to protect them. Some governments have understood that message. In 2009, president Obama declared digital infrastructure a strategic national asset. Another example is the Government of Canada, which has formulated a counter-terrorism strategy stressing the need for an integrated approach by all levels of government, law enforcement agencies, the private sector and citizens, in collaboration with international partners and key allies, such as the United States of America. It is to be expected that after the Paris attacks, governments will tighten these measures, with possibly significant negative consequences for the global supply chain. The private sector should follow suit, and the first necessary step is to accept the likelihood of such attacks. That is not often enough the case. A report prepared by the Supply Chain Management Faculty at the University of Tennessee found that while two thirds of supply chain companies employed risk managers, but virtually all of those internal functions ignored supply chain risk. In light of the current global developments that is a risky position to take. Terrorist threats, sadly, have become a part of our life. We should do all we can to avoid another Paris or San Bernardino attack. But while public safety is paramount, we should not lose sight of our supply chain safety either. Being aware of the risk and potential impact is a first step. Taking action within our own countries and companies to prevent such attacks is the next.